Joining a Barter exchange or trade exchange can be a great move for your business and personal life. Trade exchanges or barter companies offer many benefits to you such as a way to increase cash-flow by saving money and turning excess capacity or unused time into purchasing power that can be used to grow your business. Personal benefits are many; most barter exchanges have members that offer vacations to different parts of the world as well as restaurants, limos, spa treatments and many other services. It is very exciting to take something you are barely using or time you had booked and turn it into a usable asset in your business. So what is the best way to pick a Barter Exchange to join? Know this, all Trade Exchanges are not created equal and to protect your money and time here’s some things to take into consideration. deciding on a Barter Exchange to join. 1. How ﻿﻿﻿﻿﻿many ﻿﻿﻿﻿﻿active members do they have? How many members does the trade exchange have currently? Now, this may not be a deal breaker, but for a Barter Exchange to start to have momentum (active trading) it needs to have 300 members or more. While some exchanges may have more than 300 members, you need to get an idea where the members are primarily located. Having 300 members spread out over five states is pretty worthless compared to 150 members in one city. Also, by active, we mean how many members are ACTIVELY trading each month. Some Barter exchanges say they have 1000 members, but if you probe a little, you may find that only 200 of those members are active. So getting an idea as to the number of active trading members will be very helpful. Interview Any Potential Trade Exchange Like A Pro! This List Of Questions Will Save You Money, Time And The Headache Of Joining The Wrong Barter Exchange. 2. What types of members do they have? What types of members make up the Barter Exchange? Is it a good mix of restaurants, contractors, hotels, accountants, electricians, retail shops, marketing and advertising services. Most important, do they currently have a member base that offers services that are of particular interest to you. Meaning if you own a dog grooming business, do they have any members that could immediately benefit your company or you personally. Related: What’s The Best Barter Exchange To Join? For example, a member that offers dog cleaning supplies or a property management company that has a retail space that you can rent on barter. Take a close look at the member base and make sure that it is a good mix. If you do not see any members that could be beneficial to your business or you personally, ask is there a plan to gain new members in your area of interest. 3. How long has the Trade Exchange been in business? In finding out how long the Trade Exchange has been in business, it will clue you in as to how savvy the owners may be, and some insight into the people behind the Trade Exchange. If it is a new exchange, that is not a deal killer and may be a good thing if they have a good plan in place. Be sure to get an idea of what their plan is to grow. The reason why this is important is that by selling your products or services through the Barter Exchange, you are investing in it and by knowing what the businesses plans are and how long they have been in business you are protecting your investment. The fee structures to join different trade exchanges can range anywhere from free to $1000. In fact, Bartercard Australia and Bartercard UK charge as much as $1500. Just like any other business decision, you have to look at the value proposition of your investment. By taking everything into consideration in this article, it will help you make a wise decision. Just because one Trade Exchange is free and another is $1500 you cannot judge it by that alone, because Bartercard Australia and Bartercard UK are excellent Barter Exchanges and they offer an immense amount of value, the higher sign-up fee may be very well worth it if you live in that area. Always check to see if promotional price is available. As of this writing, we have NO AFFILIATE agreements with anyone mentioned in this article. In the United States, there are Trade Exchanges that are free to join, or at least they waive the signup fee, some of which are pretty decent. When looking at the fee to join, also take into consideration how accessible is their team or your dedicated broker (A Person who works with you to help you do your trades and sell your Products/Services). So if the fee is higher than a competitors, ask them what do they offer that their competitor does not. 5. What are the transaction fees? Transaction fees can range from 5% to 15% Cash. Some Barter exchanges will charge some of that in trade dollars or a blend of cash and trade. Ideally, you will always want to try to have your transaction fees charged to you on the Buy side, meaning that when you sell, you are not charged a fee, only when you buy are you assessed the fee. That way you only have fees assessed when you can buy something with your trade dollars. In addition to the transaction fee, some Barter Exchanges charge fees quarterly, like a membership fee, some will charge one monthly. It can range anywhere from $10- $50 per month or quarterly. 6. Do they have a location and dedicated staff? While this is not as important as it used to be, it is still good to know in your evaluation process. If the Barter Exchange has a location, they may have a showroom where they showcase retail merchandise for sale that members offer up. Also, makes you feel more secure that the trade exchange has a location in case you need to stop by and speak to someone. Like your current bank, it just makes you feel good to know that the people you are doing business with are accessible in person and by phone. A solid working relationship is why you want a dedicated broker that you become familiar with and that is familiar with you and your business. When you get going in a great barter exchange, this will be a treasure having your Trade Broker be like an extension of your team. 7. Can you provide me a list of referrals? Request a list of referrals that you can speak with to ask them questions about the Trade exchange in question. Take note if they are reluctant to give it to you, it could be a red flag that they may have something to hide. Providing they give you a list of referrals, take the time to reach out to them and ask them how long they have been members of the exchange, what their experience has been, have they been able to easily spend their trade dollars, has there broker kept in contact with them on a reasonable basis (usually once a month, depending on how active you are). You also want to know are they easy to get in contact with when issues or problems arise. Finally, ask them how do they typically spend their trade dollars? Most everyone will be more than happy to tell you and answer all questions because they will be excited you are considering joining the Trade Exchange. Seeing the marketplace, which is like an online store like Amazon, exclusively for members of the exchange) will give you an idea of the types of goods members sell. Good Trade Exchanges have excellent marketplaces, and you will be able to find all sorts of merchandise. While this does not give you the whole picture, it will serve as an indicator. You also want to pay close attention to how the items are priced. 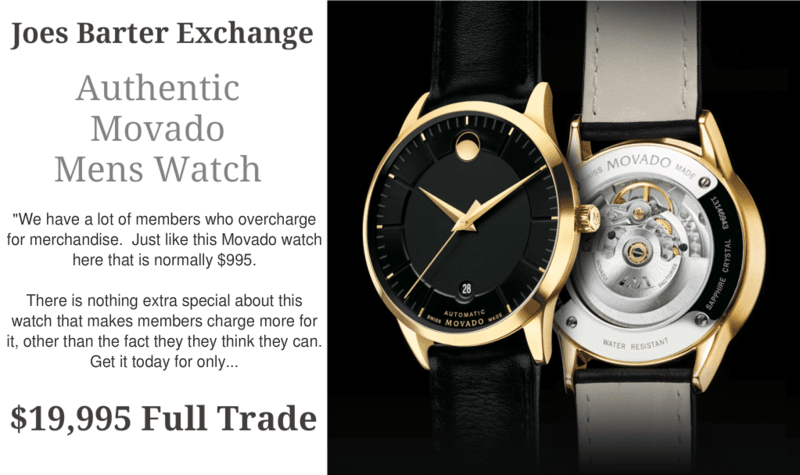 For example, if you notice a Movado Watch that should typically sell for $995 being offered on the marketplace for $2995 that may be a sign that members are drastically overcharging for their items because of it being sold for barter. This is a no-no, although in some Barter Exchanges it still happens. So you have to be careful of this price gouging. Whenever you notice severe overpricing, quickly report it to your Trade Broker. Not always, but sometimes it may mean that the members do not value the currency and are overcharging as a result of it. In the superb exchanges, the prices are usually close to fair retail, as most members value the currency and price their products/services fairly as a result. 9. How does the Barter Exchange market to their members? You want to know how the Barter Exchange plans on marketing your business to other members. Some exchanges send out a daily email blast, while others will do voice blast or personally call up members to tell them about new members. This is important because it makes it easy to earn trade dollars and helps you to create new opportunities by utilizing the Trade exchange as it was intended. When you have business being referred to you from the exchange with no effort on your part to get it, will be very exciting, especially when you can spend your trade dollars on things you need for your business or personally. 10. How many new members on average join monthly? If the Barter Exchange does not bring in new members often, it can be a sign of a weak sales team or a lack of interest in the Trade exchange itself. In either case, you are looking for a Barter exchange that is actively recruiting new members on a constant and consistent basis. It is this activity that increases the value in the trade dollars that you earn and adds more trading opportunities for you and other members of the Barter exchange. Great Barter or Trade Exchanges have aggressive sales people always bringing in new members. Plus, if the exchange is outstanding, they will get a lot of new members monthly by current member giving referrals. Which is a true testament of how well the Barter Exchange is being operated. 11. Is the Exchange in the black? 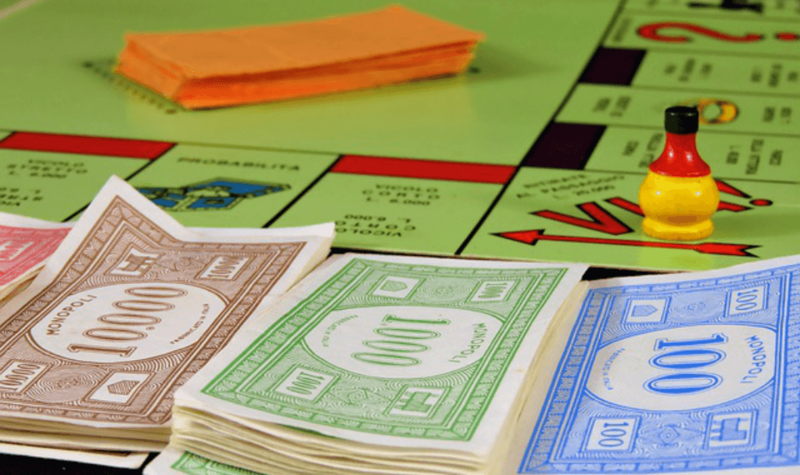 Let’s face it, running a Trade or Barter Exchange is like having your own Federal Reserve, meaning the Barter exchange can literally print (credit to the system) trade dollars (money) on demand. Quickly as possible it is the Barter Exchanges primary responsibility to bring in product and services to eliminate this deficit and to bring the Trade Exchange into the black (make it positive). Some Barter exchanges may be reluctant to answer this, but ask for it anyway. A Barter Exchange is a Third Party Record Keeper, not a bank, but it keeps a record of the transactions. So the need to know that the right amount of trade dollars to product and services in the system needs to be balanced. 12. How many members are Local/National? You may have a trade exchange that has 20,000 members nationally and 20 in your area. If you never travel or don’t travel often, you may be better off with a Trade Exchange that has 250 members in your area. Now on the other hand if you do travel or your business can benefit from advertising nationally, then even if they have a lower membership base in your town, you may still want to go with the national Barter Exchange. Depending on where you are at financially, it may be in your best interest to belong to more than one exchange to ensure that you can turn your excess capacity or unbooked time into something that you can effectively use based on your business and personal needs. Reviewing your life plan and business plan when joining a Barter Exchange is crucial because it will aid you in choosing the right trade exchange. Joining a Barter Exchange is a great thing for Business Owners and Professionals, let this article just serve as a guide to help you make the best decision. If you have additional questions that you think should be asked, please leave them in the comments below. The 17 Essential Questions You Must Ask Any Barter Exchange Before Thinking About Joining Them! This List Of Questions Will Save You Money, Time And The Headache Of Joining The Wrong Barter Exchange. This List Of Questions Will Save You Money, And The Headache Of Joining The Wrong Barter Exchange.